Stallion 51’s UAT L-39 Turbojet (N39UA) was built in 1981. N39UA is outfitted with state of the art EFIS (Electronic Flight Instrument System) and AHARS (Attitude, Heading and Reference System) flight instrumentation with capabilities to withstand extreme flight attitudes. L-39 is structurally rated for +8g and -4g that allows the students to make mistakes in recovery and learn from them. 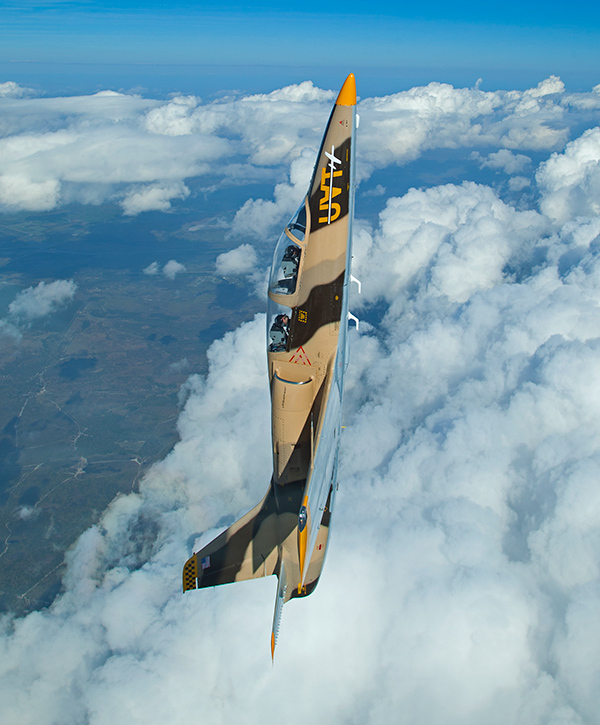 The L-39 is one of the first turbofan-powered trainers produced and is the most widely used jet trainer in the world. There were approximately 3000 L-39s produced since 1969 by the Aero Vodochody aerospace manufacturer in Czechoslovakia and used in over 30 foreign countries. There are approximately 265 L-39s registered in the US. The L-39C Turbo Fan Engine generates 3800 lbs of thrust. Maximum speed: 0.8 mach or 565 mph.